Essentially, I believe there are 4 Stages of Teaching Kids to Clean. For me, it’s been a natural progression from picking up their toys to harder kid’s chores like scrubbing toilets. Recently, I’ve been increasing my kids’ chore lists. 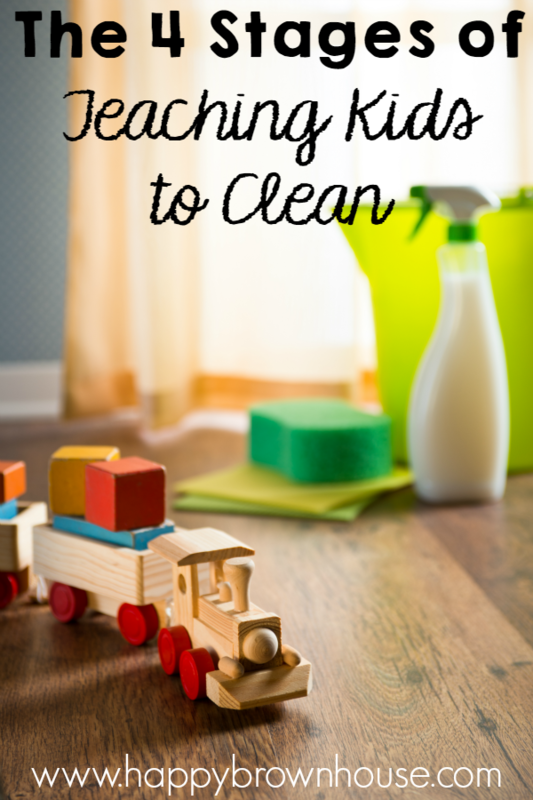 When I introduced the Bathroom Cleaning Kit for Kids and the Free Printable Bathroom Cleaning Checklist for kids, I got questions about how to teach kids to clean. While I don’t consider myself an expert in getting kids to clean, considering I can, at the time of typing this, look around the floor and see various clothing and toys my children have “forgotten” to put away, I do have some thoughts. Some of these opinions come from my years as a mother (8 so far) and my 5 years of teaching children before that. Some of my “theories” about parenting and child development came from my years of college–I received an undergraduate degree in Child & Family Studies with an emphasis in Early Childhood Education and a graduate degree in Urban Education. While all of those years and theories amount to two pieces of paper with a seal, I believe my biggest credential is that I am the oldest of six and lived these stages of learning to clean in my mother’s house. Not only that, I made it to stage four–Independent and Responsibility. It’s the ultimate goal, after all. 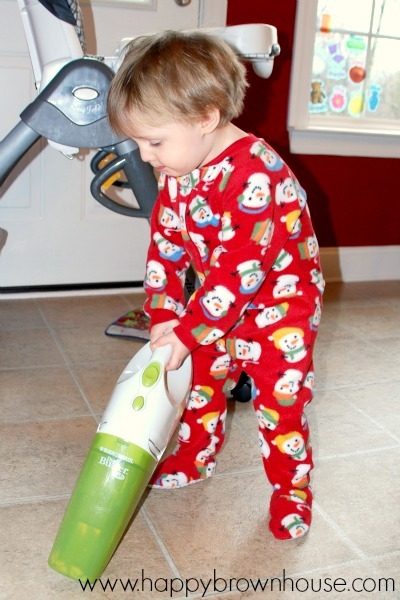 I am a firm believer that kids should work along side you, observing and participating in a shared cleaning experience. As you clean, point out things that need attention or that are dirty. This is the time to teach your kids all of those cleaning pet-peeves you might have or pass along your cleaning OCD to them. For example, this is the time to teach them the way you want the toilet paper placed on the roll! Mommy’s Little Shadow stage was for a large portion of the beginning of my kids’ early years. For reference, my 4 year old is still in this stage with some of his chores. Some of the cleaning tasks that my little shadows help me with are picking up toys with help, throwing clothes into the washing machine, placing the wet clothes I hand them into the dryer, closing the dryer door, and pushing the button on the appliances when instructed. While my 4 year old is still mostly in “Mommy’s Little Shadow”s Stage for a few things, he is in the “I Try” stage for several tasks. For example, he tries to make his bed. No matter how wrinkled or crooked the sheets are, he is trying to pull the blankets up, and for that effort, I am proud. The more practice kids get in the “I Try” stage, they more successful they will be in the end–eventually, they will make that bed perfectly! 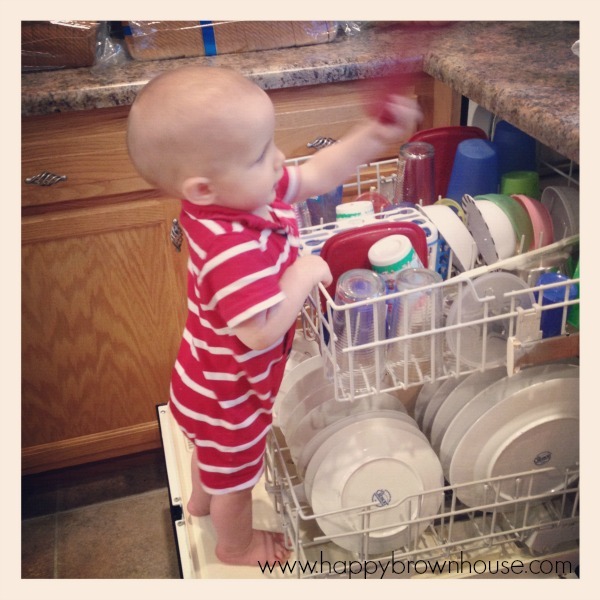 While “I do it myself!” is one of the favorite phrases of many young children, this stage is not for the independent toddler. The “All By Myself” stage is when children have finally mastered the chore by themselves consistently. This stage still requires occasional reminders, but with a reminder, the child can still accomplish the chore. I personally LOVE this stage! We are in this stage with our 8 year old, and I am finally seeing the fruits of all the hard labor in the previous stages with our oldest. This is the stage I really start to depend on the kids a lot more, and they step up to the plate. While each child is different in work ethic and personality, this stage can be a real blessing for the busy mother of lots of littles. 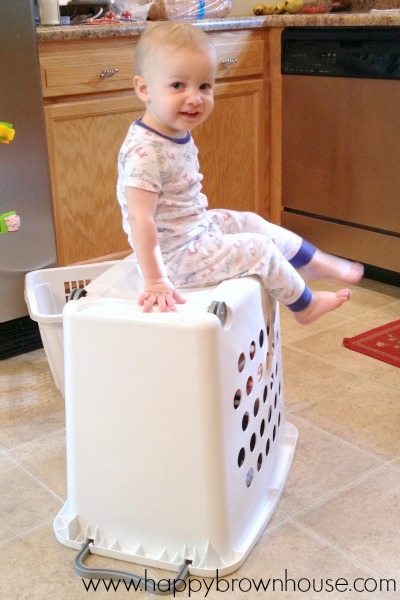 Kids are old enough to take things to the trash cans outside, load dishwashers and start them by themselves, start and finish laundry, and so many more things. This is when I, as a mother, finally feel able to catch a breath…and a break. If you make it to the Independent and Responsibility stage, give yourself a day at the spa, momma. You’ve made it! This stage in teaching kids to clean is when kids are responsible to remember to to do tasks independently without prompts…because it’s just a way of life for them. This is the ultimate goal! If we are to launch our children into the world well, this is the stage we want our kids to be in for several years before they leave the home because this is where they get that practice for being on their own. Take a look around at our society and you can quickly identify the individuals that haven’t made it to this stage…even as adults! We don’t want that to happen to our children. 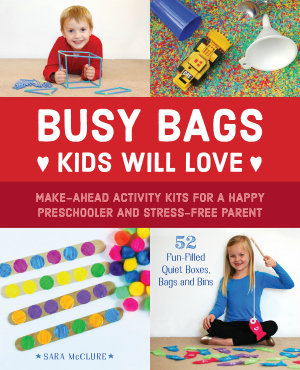 We want them to have those kid chores become a way of life and become ingrained in their character. So, this is the stage to strive for. Children (tweens, teens, and beyond) are to be guided to this stage with a lot of hard work from mom and dad, but eventually, the hard work WILL pay off! This is the stage where kids will load the dishwasher, just because they see it needs to be done. Hallelujah! You’re tired, worn out, and picked up those toys five minutes ago, but now the toy basket has been dumped…again. Hang in there. It will get better. It will happen. Your kids will learn how to get that character underwear from their cute little booty to the hamper without fifteen reminders someday. And then one day, you’ll blink and they loaded that dishwasher after Thanksgiving dinner, without prompting, while you finished your pie and chatted with Aunt Gertrude. I promise. I know this because it happened to me this year–he’s 8. Solidarity, sisters! Only a few more years. You got this. I love your tips! My three year old is always wanting to “help” and my eight year old is pretty independent in his chores. Nice post. And yes – patience is needed. But, kids are kids and messes aren’t the end of the world. Yes, patience for sure, Patty! I love this! I think things like this are one of the huge benefits to homeschooling! 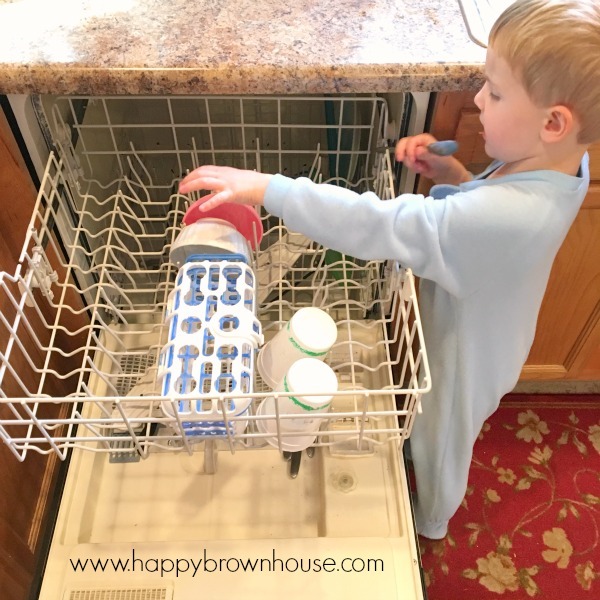 Kids have the time and energy to really contribute to the family through things like chores and the lessons learned will be helpful for a lifetime! Absolutely! Definintely a benefit to homeschooling, but I think families, in general, can use these tips to encourage independence and lifelong habits. Totally agree! I’m a certified Montessori teacher so what we’ve done is set up a couple centers in our home to encourage independence – bathroom, kitchen, dining area, and a cleaning corner in her play room. It’s been great for building responsibility and independence in household tasks, and allowing my daughter to join in on household tasks. I love the independence that Montessori encourages. I wish I was trained in it!